Dr. Ronsheim’s current research focuses on the impact and management of invasive vines, forest regeneration, and restoration ecology. Her invasive vine research focuses on two species, Ampelopsis brevipedunculata (porcelainberry or Amur peppervine) and Celastrus orbiculatus (Oriental bittersweet), and includes experimental work both in the field and in the greenhouse. Recent projects include impacts of flooding on seed germination, the persistence of seeds in the soil, and both interspecific and intraspecific competitive interactions among vine species. 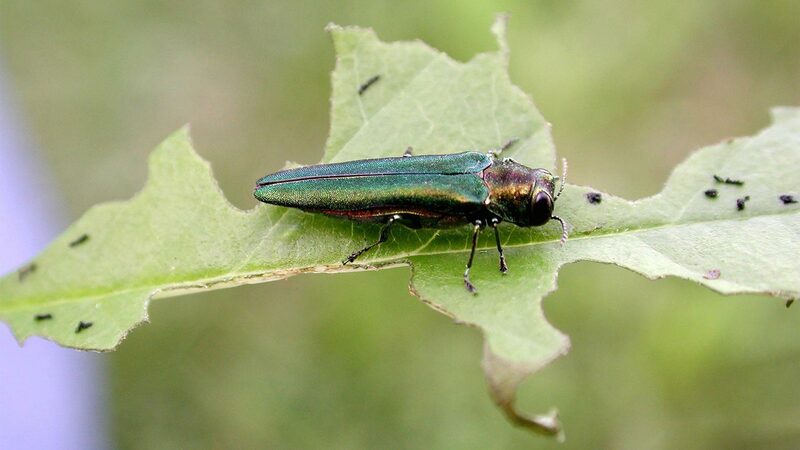 She and her colleagues have also examined the potential impact of the Emerald Ash Borer (EAB) on the forested areas of the Vassar Farm and Ecological Preserve (VFEP) and developed an EAB management plan for the Preserve. As ash trees are lost from the forest canopy, light availability on the forest floor will increase, potentially increasing the impact of invasive vines on forest structure and regeneration. Overabundant deer have caused a reduction in the seedling/sapling bank in Dutchess County, which may further impede forest regeneration in these light gaps. She and her students are currently testing methods of gap restoration, including examining whether American Chestnut (Castanea dentata) can be used to help reverse expanding light gaps in the canopy. The emerald ash borer has arrived in Poughkeepsie, and two Vassar students are working with the city and the Vassar Environmental Cooperative to track the damage. PhD, 1986-1992 Department of Botany, Duke University. Dr. Ronsheim’s current research focuses on the impact and management of invasive vines, forest regeneration, and restoration ecology. Her invasive vine research focuses on two species, Ampelopsis brevipedunculata (porcelainberry or Amur peppervine) and Celastrus orbiculatus (Oriental bittersweet), and includes experimental work both in the field and in the greenhouse. Recent projects include impacts of flooding on seed germination, persistence of seeds in the soil, and both interspecific and intraspecific competitive interactions among vine species. She and her colleagues have also examined the potential impact of the Emerald Ash Borer (EAB) on the forested areas of the Vassar Farm and Ecological Preserve (VFEP) and developed an EAB management plan for the Preserve. As ash trees are lost from the forest canopy, light availability on the forest floor will increase, potentially increasing the impact of invasive vines on forest structure and regeneration. Overabundant deer have caused a reduction in the seedling/sapling bank in Dutchess County, which may further impede forest regeneration in these light gaps. She and her students are currently testing methods of gap restoration, including examining whether American Chestnut (Castanea dentata) can be used to help reverse expanding light gaps in the canopy. Since 2010 Dr. Ronsheim has worked with her students to restore the Edith Roberts Ecological Laboratory, one of the earliest ecological restoration projects in the country. Dr. Edith Roberts, Professor of Botany at Vassar College from 1919-1949, is best known for co-authoring an early and influential book on landscaping with native plants American Plants for American Gardens. She also established an Ecological Laboratory on the Vassar College campus, creating examples of all the major plant associations found in Dutchess County at that time. Examining what elements of those original plantings remain and how the site has transitioned over time provides an important perspective for current restoration work as well as giving insight into the creation and maintenance of sustainable landscapes. Margaret Ronsheim joined the Vassar Faculty in 1992 and has taught courses in Conservation Biology (Biology/ENST 352), Restoration Ecology (Biology 282), Plant Diversity (Biology 208), and Evolutionary Genetics (Biology 248). She is an active faculty member in the Environmental Studies program and has served as an adviser for independent majors and STS majors interested in environmental science.